You've finally got that time machine up and running and can go back to the original Woodstock? Or did you give up on that pipedream and now just plan on going to a music festival in our present time? Maybe you are hoping to have a costume this Halloween that will make others say "Whoa, far-out"? Well, before you can do any of these things you need to make sure you grab this Adult Fringe Hippie Vest! You'll look like the most old-school, laid-back, peace-loving person on the scene. You will spread more good vibes than you ever thought possible when you walk around with this fringe vest and offer smiles and hugs to everyone. Show all of your friends this year that it is still love that makes the world go 'round. 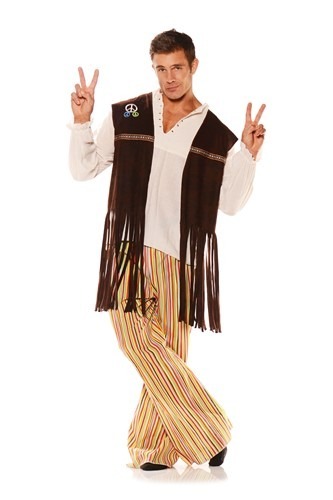 Just grab a good pair of colorful cozy pants to go with this awesome vest and you'll be the life of the party, spreading nothing but peace, love, and good times.